In December 2015, seven pieces of Caterpillar heavy equipment along with specialized atta chments, were reported stolen from a Caterpillar dealership in Evansville, Indiana. A joint investigation between the Evansville Police Department and Vanderburgh County Sheriff’s Department developed intelligence the suspects had been arrested, and several pieces of construction equipment had been recovered, in Asheville, NC as well as other jurisdictions of Indiana. Working in conjunction with the NICB and the FBI, the investigators uncovered multiple suspects who were connected with the thefts of specialized construction equipment from the states of Illinois, Indiana, Kentucky, Missouri, and North Carolina. Many of the pieces of equipment had not yet been identified as stolen nor their ownership determined. The product identification numbers (PIN) and identifying labels had been altered or obliterated. In January 2015 law enforcement began the process of identifying eighty-three (83) pieces of heavy equipment, commercial trucks and construction trailers. Numerous attachments such as buckets, blades and augers also had to be identified and cross referenced to each machine. After five (5) days of labor intensive examination, approximately $2,000,000 of equipment was identified as stolen. The equipment was insured by eight different (8) insurance companies with some pieces self-insured by the theft victims. A total of eight (8) suspects were charged with multiple felonies to include crimes of; theft, burglary, sale or possession of stolen motor vehicles, money laundering, inter-state transportation of stolen vehicles and insurance fraud. 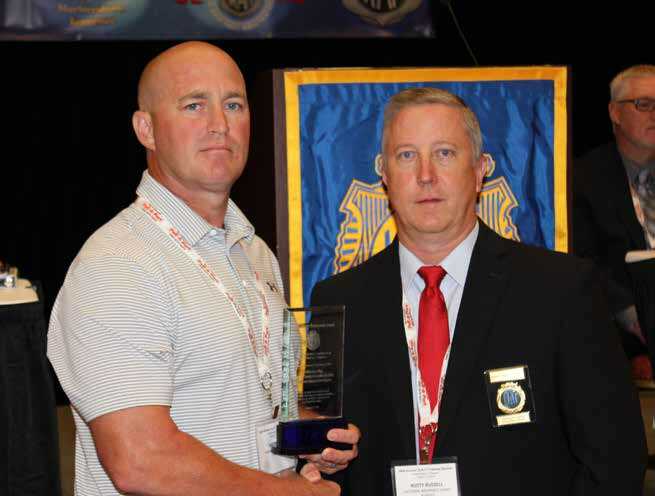 As a result of their tireless efforts and determination to see this investigation reach a successful conclusion Detective Kenny Fields (Evansville Police Department), Special Agent Kevin Haggard (National Insurance Crime Bureau), and Detective Jason King (Vanderburgh County Sheriff’s Office) were awarded the 2016 IAATI Heavy Equipment Award in Murfreesboro, Tennessee during the 64th annual training conference. The winners of this year’s Heavy Equipment Award investigated and successfully prosecuted one of the largest stolen heavy equipment cases in the Ohio Highway Patrol’s history. Detective David Morris requested NICB assistance in the identification of three machines left abandoned at a job site. With the assistance of NICB, Detective Morris determined the machines were in fact stolen. Detective Morris then contacted Trooper Mike Russell of the Ohio State Highway Patrol Vehicle Theft Unit and NICB SA Paskan requesting assistance with the interview of Robert Martin regarding thefts of heavy equipment in a multi-county area. Trooper Russell and SA Paskan interviewed Martin and determined that he had several properties where he was storing construction equipment. Martin was not forthcoming with the locations of these properties. The investigators subsequently identified and contacted associates of Martin and landowners where Martin had performed construction and excavation work. This resulted in the identification of several possible locations where heavy equipment and commercial trailers were stored. The investigators then coordinated the use of the Highway Patrol’s aviation division to fly over the properties in a multi-county area verifying that additional heavy equipment was stored at these locations by Martin. The investigators developed probable cause for search warrants for three separate properties in Mahoning and Columbiana Counties associated with Martin/Yukon Excavating. The search warrants were executed by the Ohio State Highway Patrol’s Vehicle Theft Unit and Office of Investigative Services, Cortland Police Department, Goshen Township Police and NICB. An additional five consent searches of properties in the area were performed to gather additional pieces of stolen heavy equipment. The case concluded with the defendant, Robert Martin, owner of Yukon Excavating entering a guilty plea in Mahoning County Common Pleas Court and being sentenced November 19th, 2013 to a 4 year prison term with an additional 3 year post release control. Martin was also ordered to pay restitution in the amount of $151,808.62. This investigation facilitated the recovery of 42 pieces of stolen heavy equipment valued in excess of $2,000,000 dollars. Investigators gathered over 111 pieces of evidence in the investigation and conducted interviews of 17 witnesses and victims. Much of the heavy equipment recovered had their manufacturers PIN and/or serial numbers removed or altered by Martin making them difficult to identify. These investigators continue to excel in the recovery of heavy equipment and participate in the training of law enforcement officers statewide through outreach seminars conducted with the Ohio Auto Theft Investigators Association, North East Chapter of IAATI and the Ohio Peace Officer Training Academy. 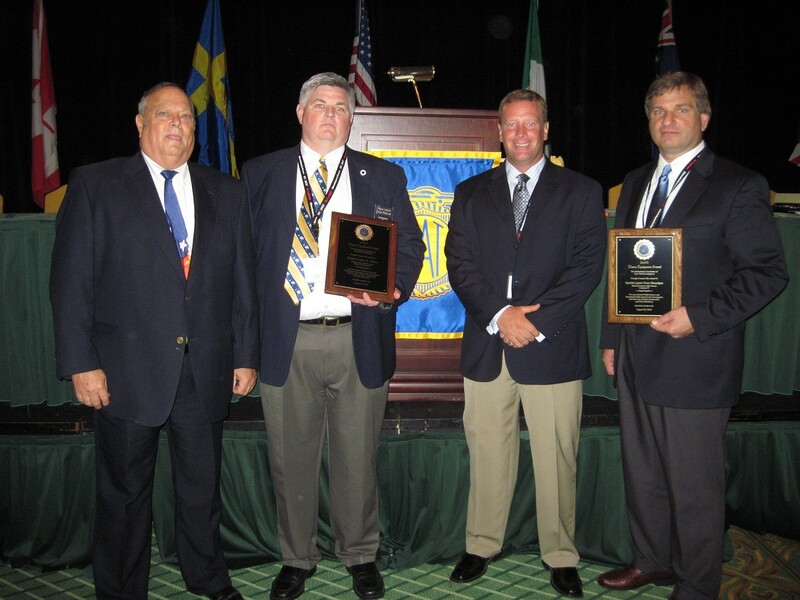 (L -R) President Peter Perrien and SCRC President Danny Sheppard presenting the Heavy Equipment Award to James K.Schweitzer, Senior VP and COO of the NICB who accepted on behalf of the team of investigators. In November 2012, the APB carried the story of an investigation by a Sûreté du Québec unit comprised of members of the RCMP, the SQ and municipal forces, with Sgt. Bernard Gravel as its lead investigator. Project Grue set its sights on a ring specializing in the theft of pickup trucks and heavy equipment such as large excavators, fork-lifts, dump-trucks, snow-plows and compactor rollers. Ultimately, twentyfour people were arrested and $1.5 million worth of vehicles and parts were seized as well as $949,000 in counterfeit US dollars and a building worth $1 million. The report of this investigation was submitted to the Heavy Equipment Award Committee for consideration and after deliberation, the committee awarded this nomination the 2013 Heavy Equipment Award. 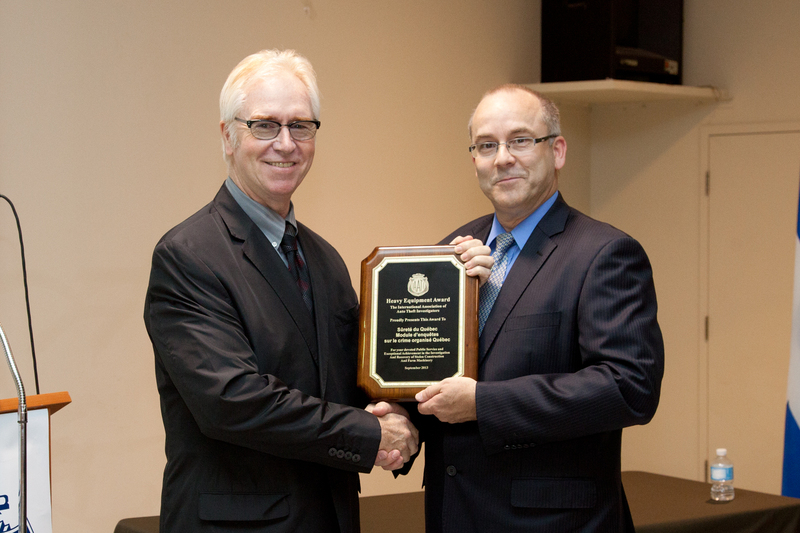 The award and plaque were recently presented to the Sûreté du Québec at their HQ in Québec City by Past President Stephen Gobby. Congratulations to all who participated in this investigation. Félicitations à tout ceux qui ont participle à cette enquête. On Friday November 11, 2011, Tennessee Highway Patrol Special Agent in Charge Stacy Williams received a call from Grundy County Detective James Cox. Cox reququesting their assitance on a search warrant at a residence outside Tracy City due to a large number of items on the property. Fayetteville Police Lieutenant Joel Massey had received information that led officers to the location. A John Deere Gator was located in a garage and the Product Identification Number (PIN) had been removed. Sergeant Scott DIckson and Williams inspected the vehicle, contacted Senior Special Agent Juimmy Carl Ball with the NICB, and was able to determine it was an active theft from Mt. Juliet , Tennessee. Near an outbuilding containing auto parts and horse tack, Williams found a tag that described the model and price of a Kubota mower matching the mower stoilen from Fayetteville, Tennessee. During the search, Fayettevilleofficers found evidence linkinga vehicle and trailer to the theft from their city. Dickson was able to identify a mowing machine as stolen from Rutherford County, Tennessee and also seized a utility trailer because the PVIN had been removed. On Tuersday 15, 2011, Cox and Williams spoke with a cooperating witness (CW) about the equipment case. The information led to recovery of a stolen Zero Turn Mower and a John Deere Gator. This information also led investigators to Fentress County where Lieutenant Troy Human was able to recover a stolen dozer and exavator. Sherrif Brent Myers asked our division to take ouver the investigation due to the large number of items that would possibly be recovered and because the thefts had occurred within several different counties and states. Dickson was assigned to be the case agent and took over the investigation. Over the next few weeks, Myers, Cox, Dickson, Human, Williams, and Ball were able to locate and recover more stolen equipment and conduct numerous interviews. The recoveries included, John Deere Gators and Zero Turn Mowers, Kubota Zero Turn Mowers and a Kubota farm tractor, Scag Zero Turn Mowers, several skid steers, backhoe, dozer, excavator, manure spreader and 10' bush hog. Williams contacted Federal Bureau of Investigation Agent Paul Healy and briefied him on the case. Healy agreed to adopt the case and present it to Assistant United States Attorney, James Brooks for possible prosecution as an Interstate Transportation of Stolen Proerty (ITSP) case. 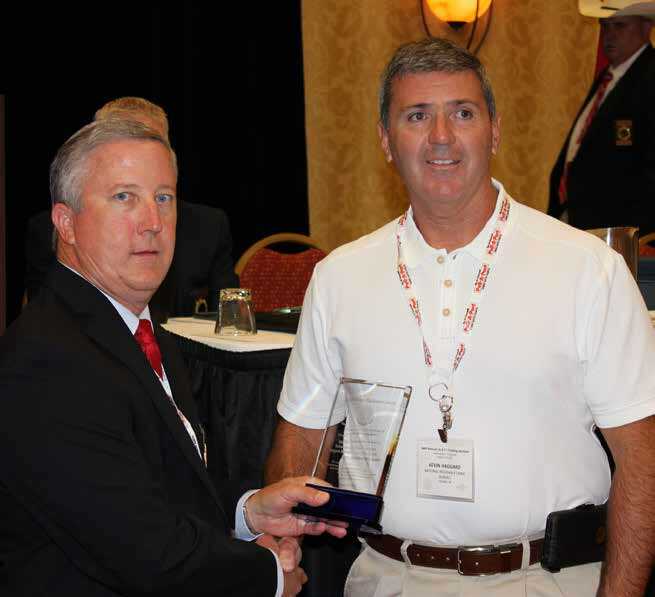 There were two groups of winners of the AGC Heavy Equipment Award this year in Atlantic City. WINNER NO. 1 The first award presentation went to Detectives David Gunter and Aaron Fenimore of the Fayette County Sheriff’s Offi ce along with Special Agent David Renaud of the National Insurance Crime Bureau. On Tuesday, May 18, 2010, Captain Tom Elrod (Chief Pilot) and Captain Greg Craft (Aviation Unit Commander) lifted off for general patrol in the Fayette County (GA) Sheriff’s Offi ce helicopter known as Hawk One. As soon as they were airborne they received a LoJack signal and began tracking in the direction of the signal. They contacted dispatch for verifi cation of the LoJack code, which came back to a Caterpillar D8 dozer reported stolen that same date from adjoining Spalding County, GA.
Hawk One tracked the LoJack signal to a location on Morgans Mill Road in South Fayette County. It was diffi cult to determine which piece of heavy equipment the signal was emitting from since the area was wooded and there were several pieces of heavy equipment spread out over approximately fi ve acres. Hawk One continued to orbit the area until uniform patrol deputies could arrive. Deputies detained four suspects at the 1994 Caterpillar D8 dozer stolen from Spalding County earlier that day. These suspects had already removed the blade from the dozer and were using a cutting torch to remove the front of the D8 dozer when spotted by Fayette County Sheriff’s Offi ce helicopter, Hawk One. Det. David Gunter responded to the scene to investigate. Once at the scene Detective Gunter discovered the property was over fi ve acres and contained numerous units of heavy equipment, whole and in parts. Detective Gunter identifi ed a second piece of heavy equipment a Caterpillar 953C track loader that had been reported stolen from Henry County, Georgia on May 13, 2010. The identity of the second stolen unit led Detective Gunter to seal off the property until a search warrant could be obtained. The four suspects were arrested at the scene. The following day, with search warrant in hand, Detectives David Gunter, Aaron Fenimore and. Sgt. Keith Whiteside (Fayette County Sheriff’s Offi ce) arrived on scene and began their search. They were assisted by Bill Burris from LoJack, Special Agent David Renaud from the National Insurance Crime Bureau and Dan Peter from Yancey Brothers Caterpillar. Heavy equipment in varying stages of dismantlement was scattered over fi ve acres of wooded property. There were numerous cabs, buckets, blades, tracks, engines, radiators and other parts that had been removed from machines. Unlike passenger vehicle chop shops, the massive size and weight of each piece of heavy equipment part created unique challenges when it came to identifi cation. Investigators and support personnel worked tirelessly to try and identify each part they discovered and link that particular part back to the donor machine. Det. Gunter and Det. Fenimore spent a total of ten (10) days executing this search warrant trying to identify hundreds of parts to their respective stolen piece of equipment. At the conclusion of the search warrant Detective Gunter and Fenimore, along with Special Agent Renaud had identi- fi ed and recovered a total of nineteen (19) pieces of stolen equipment and vehicles valued at $ 2,192,500.00. In all, the Fayette County Sheriff’s Offi ce had more than fi ve-hundred man hours just on the site of the search warrant related to detectives, crime scene investigators and deputies who worked to secure and recover all of the property. Detectives Gunter and Fenimore made seven arrests in this case charging those arrested with Operating a Chop Shop and additional counts of Theft by Receiving. The case is being prosecuted as a Racketeering case. The vehicles and equipment were reported stolen were from nineteen (19) different counties within the State of Georgia. The winners’ dedication to duty, determination, stamina and desire to solve crime was apparent in the hundreds of hours spent on this investigation. The quick response by the pilots of Fayette County Sheriff Offi ce’s helicopter, Hawk One, to a LoJack activation signal led to the uncovering of an organized theft ring the likes of which were unseen by this region until now. The countless days spent by Detectives Gunter and Fenimore, along with Special Agent Renaud searching, recovering, and identifying piece after piece of equipment parts proved successful and resulted in multiple arrest and the dismantlement of a major criminal enterprise. The citizens of Fayette County Georgia should be proud of those who serve and protect them for they are safer thanks to their efforts. In addition to the three winners of this award, there are many more who provided assistance and worked tirelessly during this investigation. It is estimated that as many as thirty personnel from the Fayette County Sheriff’s Offi ce were involved with this investigation at one point or another. The second group of winners of the AGC Heavy Equipment Award were Detectives Mark Burger of Baltimore County Police Department and Jim Frauenhoffer of Baltimore City Police Department. Both are members of the Baltimore Regional Auto Theft Team. Detectives Frauenhoffer and Burger have been members of the Baltimore Regional Auto Theft Team since its inception. As partners, they have provided enthusiasm, dedication and experience to the unit. These two nominees work major case investigations and they use a variety of techniques, including the use of informants, to investigate professional car theft rings. They also investigate thefts of construction equipment, truck/ trailer and cargo theft and motor cycle/ All-Terrain Vehicle (ATV) theft cases. Their success is not predicated on the total number of arrests they make, but rather the quality of the cases that they make against professional vehicle thieves. During the last half of 2009, the Baltimore metropolitan area suffered a huge spike in theft of construction vehicles and machinery. The crimes varied greatly regarding the types of machines that were stolen, when they were stolen and how they were being transported. Detectives Frauenhoffer and Burger began investigating these thefts sorting through the few pieces of evidence. On October 21, 2009, Detective Fields was contacted by a truck driver for a local heavy duty towing company and was told that the day before, a customer had contracted tow company to use their trailer to pick up and deliver a Caterpillar D5 bulldozer from a job site in Harford County, MD. The driver was followed by the customer, who called himself Chris Banning, to the job site which was actively being worked by a large road-building company upon their arrival at approximately 11pm. In fact, a Maryland State Trooper in a marked police car was 50 yards away acting as a highway safety operator. Banning went to the bulldozer, started it up, drove it onto the trailer and strapped it down himself, a process that took over 20 minutes. The driver, along with Christopher Banning, then drove it to a remote area in Elliottsburg, PA (90 miles away) and left it behind a mulch business almost in the woods. The driver explained that the customer always paid cash and often contracted with his company during the overnight hours. He felt this last job was especially strange, but assumed it was legitimate due to the police offi cer being nearby and that none of the workers questioned him. It was learned that the Caterpillar D5 bulldozer was reported stolen to the Maryland State Police. The machine had a value of $75,000. (CASE #1) The suspect was brazen enough to steal it within eyesight of the police offi cer and employees of the victim. The ensuing investigation revealed the “customer’s” name was indeed Christopher Banning. Upon reviewing several of the recorded tow slips, a phone number for Christopher Banning was also obtained. Detectives learned that Christopher Banning had used this same phone number in recent arrest reports as his own. Upon putting a photo array of Christopher Banning and 5 other look alike images, witnesses positively identifi ed Banning. Upon interviewing other tow drivers and analyzing the tow company trucks’ embedded GPS devices, Detectives Frauenhoffer and Burger determined where the Caterpillar D5 was delivered and prepared a Search and Seizure Warrant. On October 23, 2009, with signifi cant assistance from the Pennsylvania State Police Auto Theft Unit, particularly assigned Detective Steven Myers, RATT executed a Search and Seizure Warrant at 5367 Veterans Way in Elliottsburg, PA and located the stolen Caterpillar D5. The owner of the property was interviewed and explained that he bought this machine from a black male who told him his name was “Curtis Bowers”. He explained that he didn’t know it was stolen and provided another address where “Curtis Bowers” sold a 2007 Case 420 Skid Steer loader to a friend. Detectives Frauenhoffer and Burger then inspected that machine and identifi ed it as being stolen from Baltimore City on June 4, 2009. The interviewee then admitted to buying a John Deere 310 Backhoe Loader from “Curtis Bowers”, but had moved it to get repaired. Upon being taken to that location several miles away, the detectives identifi ed it as being stolen from Baltimore County, MD on July 13, 2009. A review of tow slips revealed that Banning had contracted with the same tow company to pick up and deliver this machine to Pennsylvania. A stolen Bobcat Skid Steer was located on November 6, 2009 in Millerstown, PA by the Pennsylvania State Police based on information gained from another witness. The machine had been stolen from the M Luis Company in Baltimore City on October 11, 2009. The suspect was identifi ed as Christopher Banning. A Takeuchi 153 Excavator was recovered during the same incident in Millerstown, PA and found to have been stolen in Baltimore County on May 15, 2009. The suspect was identifi ed as Christopher Banning. A 2006 Caterpillar 252 Skid Steer was recovered during the same incident in Millerstown, PA and found to have been stolen in Baltimore City on March 21, 2009. The suspect was identifi ed as Christopher Banning. Detectives Frauenhoffer and Burger applied for and obtained arrest warrants for Banning in Balitmore City, Baltimore County and Harford County regarding these thefts, but were unable to locate him immediately. However, a cooperating informant had been contacted by Banning regarding a skid loader that Banning wanted to sell. On November 18, 2009, Detectives Frauenhoffer and Burger, along with the Pennsylvania State Police Auto Theft Unit and other members of RATT, organized a sting operation in an effort to arrest Banning. Shortly after midnight in a remote corn fi eld 30 miles north of Harrisburg, PA, Banning arrived in a tow truck with a Bobcat Skid Loader. He attempted to fl ee but was tackled by Det Frauenhoffer and taken into custody. This skid loader too was found to be stolen in a Burglary in Baltimore City earlier that night. The PIN plate had been removed. Banning consented to an interview in which he denied stealing anything, but admitted to “delivering” them. He was taken to the local jail and awaited extradition to Maryland. Despite being bailed out numerous times, he is now incarcerated in Pennsylvania awaiting trial for charges received in Pennsylvania, related to this investigation. He is also pending trial in Harford County MD, and has received convictions in Baltimore. Throughout this case Detectives Frauenhoffer and Burger tirelessly worked leads to develop the suspect, recover the property, collect evidence and ensure that a prosecution was sought. Techniques used by these Detectives run the gamut of utilizing new technology (GPS and cell phone analysis) to often underestimated “old school” methods (interviewing and developing informants). Their tenacity and attention to detail led to a suspect being developed and to the recovery of a great deal of heavy equipment. In March 2011, Detectives Burger and Frauenhoffer followed a LoJack signal from a recently stolen 2010 Case 430 skid steer loader. Upon locating it in an alley, they placed a GPS on it and began conducting surveillance. While waiting, they canvassed the neighborhood, determining that a Hudson Trailer parked about a block away was illegally tagged (by a man having the last name of “Brooks”) and probably involved in the theft. Another block down, they located a white Ford E350 van parked and registered to the same “Brooks” subject. They knew, from monitoring ALL construction thefts in the Baltimore region, that one recent skid steer theft in Baltimore County involved a white Ford Van. They also knew from their extensive experience of investigating construction thefts, that a subject by the name of “Douglas Brooks” was from the area that the tags on the Ford van and trailer were registered to. It was determined, from quickly researching available databases, that Douglas Brooks was the son of the van owner. Within a few hours, they observed Douglas Brooks and another accomplice use the van to hook up to the trailer and load the stolen Case skid steer. They were stopped and arrested. The trailer was found to be stolen from Baltimore County a few days earlier. The accomplice was found to have an open arrest warrant for unrelated crimes. After consenting to be interviewed, Brooks, who remembered and acknowledged how fairly Detectives Frauenhoffer and Burger treated him in previous arrests in 1997 and 2004, agreed to speak to them. Within hours, Douglas Brooks had taken Detectives to several locations where he committed construction thefts and provided addresses, names and phone numbers to persons he sold them to. At the conclusion of the interview, Detectives had cleared 19 cases of construction theft attributed to Brooks! Although this case is still ongoing and recoveries are still being made, it is quite evident that without their constant attention to the region’s thefts, this investigation would never have developed as fast as it did. Because of this attention, another prolifi c construction thief would have continued to hurt those in the industry. Detectives Frauenhoffer and Burger have been members of the Baltimore Regional Auto Theft Team since 1994 and have successfully worked major cases involving every aspect of Auto Theft. However, their passion has been, and continues to be, construction theft. Since being assigned to RATT, these Detectives have been qualifi ed and recognized by Federal, State and City Judicial branches as expert witnesses and testifi ed in trials concerning the theft of construction equipment. During the Spring of 2011, Detective Frauenhoffer was chosen to speak at a local construction equipment retail association meeting to address the problems of construction theft and tips to prevent it. He was warmly welcomed and has since been contacted by several members to assist with problems. Both have taught both basic and advanced construction machine/vehicle theft and identifi cation to Law Enforcement officials throughout the mid-Atlantic region. If ever two Detectives deserved the International Association of Auto Theft Investigators Heavy Equipment Award, they are Detective Jim Frauenhoffer and Detective James “Mark” Burger. Nomination submitted by Detective Corporal Steven Sunderland.